London is a city full of famous sights and sweeping views, ripe to be clicked, all for the taking. The big picture isn’t everything here in the capital, though. Here is a trio of shots taken in the heart of this metropolis – but they do little to give this away. A wooden barrier dappled with lichen with crafts on the River Thames beyond. This spot is close to Tower Bridge, The Shard and London’s iconic waterside. Sunlight floods through a glass and wooden skylight. This is at Leadenhall Market, an old trading area which is now filled with shops and eateries. It sits right in the heart of the city’s financial district. This is not just near a London landmark – it is part of one. 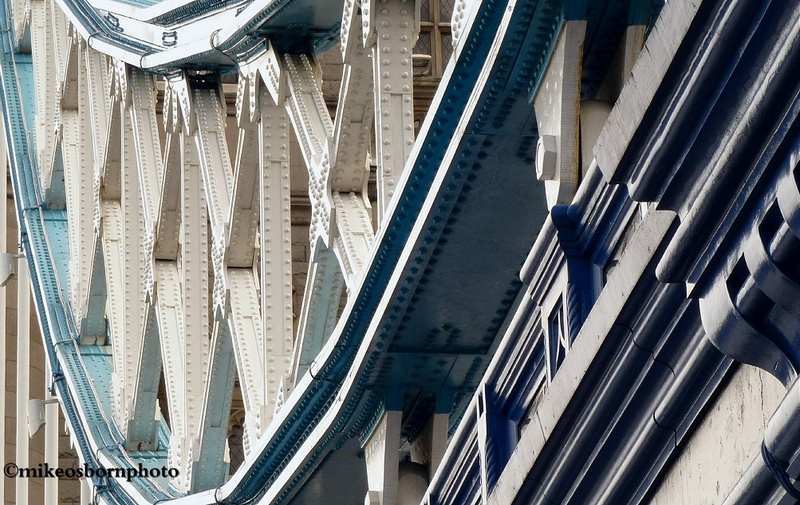 The graceful coloured metalwork is part of Tower Bridge, much better recognised for its twin towers. It’s now graced with a set of Olympic rings to mark the imminent arrival of the games in the capital. The joy of living in a world-renowned city is to have the chance to explore it at length and take photographs of its less obvious side. There is a lifetime of those captures just waiting to be found. Thank you very much, glad to hear it. There are so many of them here in London! Much appreciated as are all your comments. Thanks!